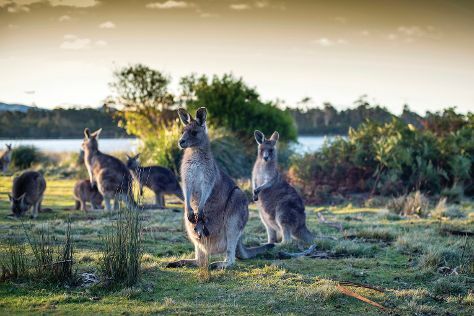 Start off your visit on the 23rd (Mon): admire all the interesting features of Coles Bay Jetty, look for all kinds of wild species at Wildlife Areas, and then trek along Wineglass Bay Lookout. Keep things going the next day: look for all kinds of wild species at East Coast Natureworld and then surround yourself with nature on a nature and wildlife tour. To see ratings, maps, traveler tips, and other tourist information, you can read our Coles Bay journey app . London, UK to Coles Bay is an approximately 31-hour combination of flight, bus, and taxi. You can also do a combination of flight and bus; or do a combination of flight, bus, and car. The time zone difference moving from Greenwich Mean Time to Australian Eastern Standard Time (Tasmania) is 10 hours. Cap off your sightseeing on the 24th (Tue) early enough to go by car to Hobart. On the 25th (Wed), appreciate the extensive heritage of Battery Point Sculpture Trail, take a leisurely stroll along Constitution Dock, then admire the natural beauty at Royal Tasmanian Botanical Gardens, then identify plant and animal life at Bonorong Wildlife Sanctuary, and finally snap pictures at Richmond Bridge. Keep things going the next day: surround yourself with nature on a nature and wildlife tour. To see photos, where to stay, traveler tips, and other tourist information, use the Hobart trip maker app . Drive from Coles Bay to Hobart in 2.5 hours. Alternatively, you can do a combination of taxi and bus. In December, daily temperatures in Hobart can reach 24°C, while at night they dip to 13°C. Finish your sightseeing early on the 26th (Thu) so you can travel to Apollo Bay. Apollo Bay is a coastal town in southwestern Victoria, Australia. Start off your visit on the 27th (Fri): trek along Great Ocean Walk, then take a peaceful walk through Mait's Rest, and then take in the dramatic scenery at Carisbrook Waterfall. Get ready for a full day of sightseeing on the 28th (Sat): explore the striking landscape of Great Otway National Park. To find traveler tips, reviews, maps, and more tourist information, you can read our Apollo Bay day trip site . Do a combination of flight, shuttle, and bus from Hobart to Apollo Bay in 8 hours. Alternatively, you can do a combination of flight and bus; or do a combination of car and ferry. Finish your sightseeing early on the 28th (Sat) to allow enough time to drive to Port Campbell. Port Campbell is a coastal town in Victoria, Australia. Visiting London Bridge and Otway Fly Treetop Adventures will get you outdoors. Step off the beaten path and head to Loch Ard Gorge and The Razorback. Spend the 30th (Mon) exploring nature at Port Campbell National Park. The adventure continues: don't miss a visit to Gibsons Steps and take in the dramatic natural features at Twelve Apostles. To see more things to do, traveler tips, maps, and tourist information, read Port Campbell trip website . You can drive from Apollo Bay to Port Campbell in 2 hours. Alternatively, you can take a bus. Finish your sightseeing early on the 31st (Tue) so you can travel to Albany. You'll explore the less-touristy side of things at Little Beach and Greens Pool. Visiting Waychinicup National Park and The Gap and Natural Bridge will get you outdoors. Venture out of the city with trips to Cosy Corner Beach (in Kronkup) and Forest Hill Vineyard (in Denmark). There's still lots to do: identify plant and animal life at Kalgan River and kick back and relax at Betty's Beach. To find ratings, traveler tips, and other tourist information, read our Albany trip itinerary builder site . Getting from Port Campbell to Albany by combination of bus, train, and flight takes about 13.5 hours. Other options: do a combination of bus and flight; or drive. The time zone difference when traveling from Port Campbell to Albany is minus 2 hours. Expect a daytime high around 29°C in January, and nighttime lows around 16°C. Finish your sightseeing early on the 3rd (Fri) so you can drive to Margaret River. You'll explore the less-touristy side of things at Dolphin & Whale Watching and Ngilgi Cave. Visiting Meelup Beach and Sunflowers Animal Farm will get you outdoors. Explore the numerous day-trip ideas around Margaret River: Jewel Cave (in Augusta), Boranup Karri Forest (in Australia Plains) and Canal Rocks (in Yallingup). There's still lots to do: Head underground at Mammoth Cave, awaken your taste buds at some of the top wineries in the area, and do a tasting at McLeod Creek Wines. To see traveler tips, other places to visit, maps, and tourist information, use the Margaret River travel route planner. You can drive from Albany to Margaret River in 4.5 hours. Alternatively, you can take a bus; or do a combination of flight and bus. Finish your sightseeing early on the 7th (Tue) to allow enough time to travel back home.